← Swami’s is in La Mesa, too! 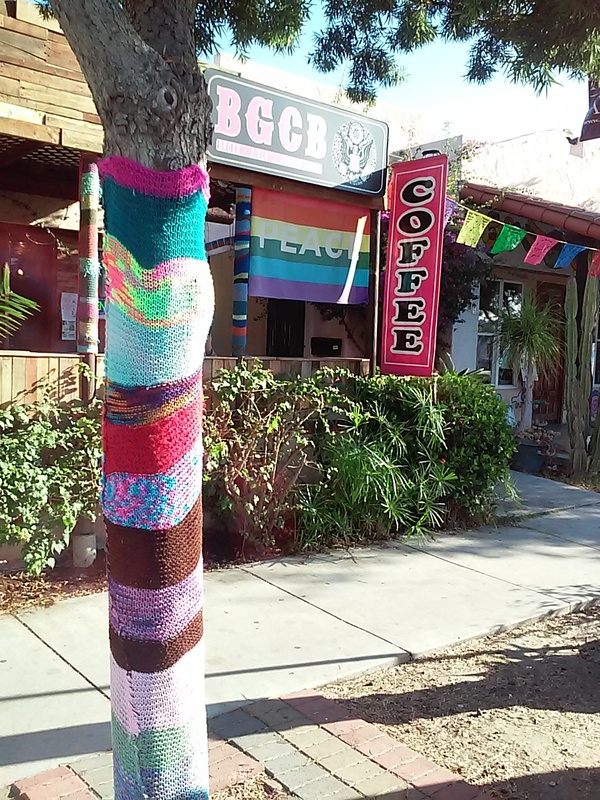 Look for the yarn bombed tree, the peace flag or the BGCB sign on Adams Ave. The name caught my attention, but so much more held it. First of all there was the friendly staff & great location (in Normal Heights next to Back from Tomboctou Gallery with their unique items & craft classes). Plus their beans are roasted by the local West Bean Roaster in the Grantville neighborhood (www.thewestbean.com). I had their cold brewed coffee & it was excellent! I sat in the shade of their sidewalk patio & cooled off as I watched life on Adams Ave. go by. Later I investigated cold brewed coffee. It’s not a hot brewed coffee that’s been iced, but rather a special process slightly similar to making sun tea. Basically coarsely ground coffee is soaked in water for approximately 12 hours. There are plenty of gadgets that will help you do this, but it’s possible to do with just a jar, a strainer & coffee grounds. For the ratio of coffee to water see http://www.chow.com/recipes/30487-basic-cold-brewed-coffee. Then there was their Suspended Coffee that intrigued me. “Is that a new brewing process?” I asked. “No,” explained the barista, “it’s a way to give a cup of coffee to someone who can’t afford it.” In other words, if you purchase two coffees, one is for yourself & the 2nd is held “suspended” for someone who can’t afford it later. There are no questions asked of this person, they just say they can’t afford it and they are not expected to repay the favor later (although they certainly may if they wish). Confused? See www.suspendedcoffees.com for more information. My suspended coffee cost me $2 & they gave me a Kind bar as a thank you (no kidding, that was the brand name of the bar). So, it was hardly a kind act given that I got something in exchange. Broke Girls are the real kind soles, though, as they are out to help others who are broke. (Note, Kind bars aren’t given every time, it depends on their supply). I’m going to come back some evening for one of their interesting events, like Long Story Short. It’s a story telling open mic on Sunday at 7:00pm. There’s also a music open mic night, a trivia game night, and even bingo (call to get days & times for these event). Adams Ave. is a destination in itself. See the various events that the Adams Avenue businesses of Normal Heights sponsors: http://www.adamsavenuebusiness.com/Events.html. The Sept. Adams Avenue Street Fair (Sept. 27 & 28, 2014) & the April Adams Avenue Unplugged are especially worth attending. There’s usually no problem parking on the Broke Girls end of Adams Ave., but it’s tougher to find parking near the Normal Heights arch that straddles Adams Ave. So, what is a yarn bomb (as seen in the photo)? It’s graffiti in the form of a knitted or crocheted tree, pole, bike rack, or anything that needs a little color. Graffiti work is usually done under cover of night, but yarn bombs are usually done with the approval of the cafe or shop owner. The first “bomb” was supposedly done in Texas, but it is found all over the world now. This entry was posted in Coffee shops in San Diego, cold brewed coffee, music, suspended coffee and tagged Adams Ave., cold brewed coffee, Normal Heights, Suspended Coffee. Bookmark the permalink.